Scott Christian Sava has done it again with another delightful story for children. His first book, ED’s TERRESTRIALS, was highly recommended by The Graphic Classroom for the same reasons that PET ROBOTS hits the spot: It is adventurous, authentic and enjoyable for young students. Staying in the science fiction vein, Sava weaves a yarn about four kids who find themselves lost during a field trip to a toy manufacturing company. The four accidentally activate four prototype robots, which bond themselves to the kids and follow them home. What do you do when a robot follows you home? Sava crafts fine stories that entertain students but do not overwhelm them. Combined with Diego Jourdan’s art, the books makes for great fun for kids. Sava’s books are artfully crafted with bits of bathroom humor, teasing, plenty of action-adventure, and nasty adult antagonists. The art is distinctively Jourdan’s, who illustrated ED’s TERRESTRIALS. His kid-friendly illustrations are bright, cheerful and full of expression. The thickness and reading level of the book make it most accessible for third graders, although the subject matter is all kid. There is some CAPTAIN UNDERPANTS-style humor that, for some unknown reason, bothers some teachers. Burps and toots don’t bother me in the least, and the kids think it is funny as all get out. When they enjoy a book then they will read it. That’s the point, isn’t it? Stealing and bad business practices make for good discussion in the classroom, both of which are main subjects in PET ROBOTS. What should the kids do when they are faced with the possession of property that is not theirs? How do they deal with it? After all, it’s pretty cool having your own robot even when it is not really yours. Add it to the list of great books for kids. 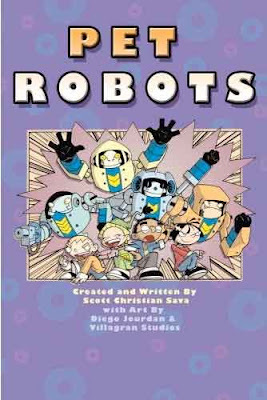 They will read books about robots and kids and big bad adults.